A Scientific Diet For Plecostomus And Other Algae Eating Fishes, Including Marine Herbivores. Great for all types of vegetable eaters including fish, snails and crustaceans. Contains pure-cultured spirulina and chlorella algae to help your underwater friends look their best, always. 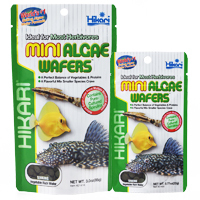 Trust the ®Hikari logo to assure your aquatic pets are getting the original and proven Algae Wafers™ formulation! Feed no more than the amount your fish will completely consume within an hour. Care should be taken to avoid over-feeding and always remove uneaten food after feeding period. Developed, produced and packaged in our facilities so we can be assured you’ll always get the ®Hikari quality you expect!